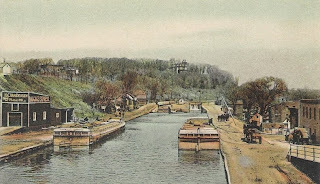 In November 1886, Captain John Frawley of the canal boat George W. Lee reached the eastern terminus of the Mohawk River at Cohoes. Before him was the Hudson River intersection: south led to Albany and New York City, and north was the path of the Champlain Canal, which ran from Waterford to Whitehall, at Lake Champlain’s southern tip. 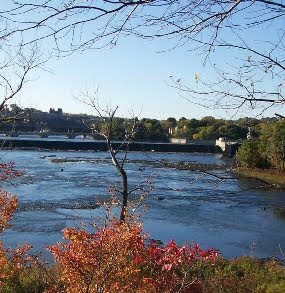 Access to the Champlain Canal was on the north bank at the Mohawk’s mouth, opposite Peeble’s Island. At the mouth of the river was a dam, maintaining calm water so the boats could cross the river, and about 500 feet upstream from the dam was a bridge. 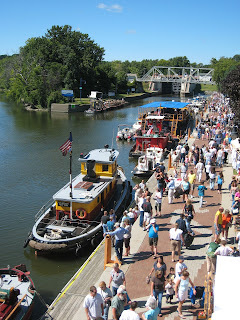 Canal boats were pulled by tow ropes linked to teams of mules or horses. To cross from the south bank of the Mohawk to the north, towing teams used the bridge, which is what Frawley did. Sounds simple, and usually, it was. But the Mohawk was badly swollen from several days of rain. Traveling at night, Frawley was perhaps unaware that the normally strong current had intensified. Water was fairly leaping over the nine-foot-high dam. Accompanying the captain were his mother, around 60 years old- his ten-year-old son- and the boat’s steersman, Dennis Clancy. To help ensure that things went okay, Frawley left the boat to assist the team driver during the crossing of the 700-foot-long bridge. They moved slowly—the rope extended sideways from the bridge downstream towards the boat, an angle much more difficult than pulling a load forward along the canal. Below them, the George W. Lee lay heavy in the current, straining against the rope. All went well until the bridge’s midpoint was reached, when, with a sound like a gunshot, the rope snapped. Horrified, they watched as the boat swung around, slammed sideways into the dam, and plunged over the edge. Nothing was left but darkness. Shock and grief enveloped them at such a sudden, terrible loss. Within minutes, though, a light appeared on the boat’s deck. It had held together! At least one person had survived, but no one knew how many, or if any were injured. The roar of the river drowned out any attempt at yelling back and forth. With the boat aground, there was nothing to do but sit and wait until morning. With daylight came great news. All were okay! But, as had happened the previous evening, great elation was followed by great uncertainty. How could they be saved? The river remained high and dangerous. The boat, resting on the rocks below the dam, could not be reached. And the November chill, heightened by cold water pouring over the dam all around them, threatened the stranded passengers with hypothermia. A rescue plan was devised, and by late afternoon, the effort began. The state scow (a large, flat-bottomed boat), manned by a volunteer crew of seven brave men, set out on a dangerous mission. Connected to the bridge by a winch system using two ropes, the scow was slowly guided to the dam, just above the stranded boat. The men began talking with the passengers to discuss their evacuation. Then, without warning, disaster struck. Something within the winch mechanism failed, and again, with a loud cracking sound, the rope snapped. Over the dam went the scow, fortunately missing the canal boat. Had they hit, the results would have been catastrophic. Briefly submerged, the scow burst to the surface. A safe passage lay ahead, but the drifting scow was instead driven towards nearby Buttermilk Falls by the swift current. Two men leaped overboard and swam for shore in the icy water. The rest decided to ride it out. In one reporter’s words, “The scow sped like an arrow toward Buttermilk Falls. It seemed to hang an instant at the brink, and then shot over the falls. It landed right side up and soon drifted ashore.” Incredibly, everyone survived intact. Chilled, wet, and shaken, but intact. Meanwhile, still stuck at the base of the dam was a canal boat with cold, hungry, and frightened passengers. A new plan was needed, but darkness was descending. The stranded victims would have to spend another night on the rocks. What an amazing, fortuitous outcome. Two boats (one at night) over a dam- three people trapped for more than 36 hours in a raging river- two men swimming for their lives in icy water- and five men and a boat over a waterfall. All that potential for tragedy, and yet all survived unscathed. Photos: The dam at Cohoes, looking west from Peeble’s Island- A canal boat scene at Cohoes.